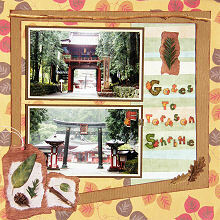 I love playing with new scrapbooking ideas but new does not have to mean difficult and time-consuming. In this page I have used an unusually shaped frame to frame my entire page and bring all my elements together. It was easy to make and yet it gives my page that 'wow' factor. Try incorporating a frame like this into one of your pages. The bolder the colour, the more impact it will have. This layout was created using Imagination Project Electric Flashes of Light paper from the Imagination Project Paper Pack, green and brown striped patterned paper, brown Bazzill cardstock, light and dark brown cardstock, brown ink, alphabet stickers, Karen Foster Redwood Forest stickers and Karen Foster Heritage stickers. Use the Electric Flashes of Light paper as your background. Cut a square-ish frame from brown Bazzill cardstock. It should be about 27cm wide. The edges can be angled for interest. Look at the layout above to decide the angles which you would like to use. Ink the edges with brown ink and set aside to dry. Cut a piece of green and brown striped paper. The precise measurements will depend on the size of your frame, but it should be approximately 10cm by 24cm. Adhere it to your background towards the right side of the page. When choosing your placement, make sure it fits underneath where your frame will be, as shown in the layout above. Adhere your frame in place. Try to keep the top edge fairly parallel to the top edge of your background. Mat your photos with light brown cardstock and again with dark brown cardstock. Adhere them one above the other inside your frame on the left side of your page, as shown in the layout above. Use the stick sticker from Karen Foster Heritage stickers to place across the top of your frame. If you wish, you can also use two leaf stickers to accent the bottom right corner of the frame. Place the large tag sticker from Karen Foster Redwood Forest stickers in the top left corner of your page. Place the square bark sticker next to it so it overlaps slightly. Place the rectangular bark sticker inside your frame and towards the top of the striped paper, as shown in the layout above. Finally, use alphabet stickers to add your title in the remaining space below your rectangular bark sticker.